Dallas, TX - A pair of paintings by the patriarch of arguably the greatest family of American artists could produce seven-figure results in Heritage Auctions’ American Art auction May 3 in Dallas, Texas. Known initially for his depictions of cowboys, pioneers and Native Americans from the Old West, Newell Convers Wyeth started imaging medieval tales of romance and adventure in the 1910s. In 1917, he executed 17 works for the latest edition of Sidney Lanier’s The Boy’s King Arthur. This version printed with Wyeth’s illustrations became an instant classic and led to numerous other commissions for the artist, including Robinson Crusoe, Last of the Mohicans, and Robin Hood. 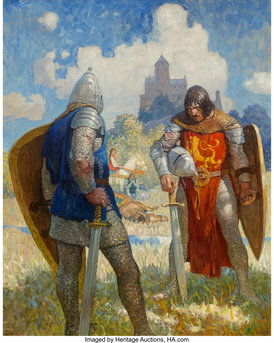 Newell Convers Wyeth "I am Sir Launcelot du Lake, King Ban's son of Benwick, and knight of the Round Table," The Boy's King Arthur: Sir Thomas Malory's History of King Arthur and His Knights of the Round Table interior book illustration, 1917 (estimate: $800,000-1,200,000) is a magnificent illustration depicting the pivotal moment at which, after hours of battle, Sir Launcelot reveals his identity to Sir Turquine, thereby necessitating a fight to the death. Wyeth, who studied in the early 1900s with Howard Pyle, sought historical authenticity and collected props and costumes like the medieval armor seen here. This particular illustration, with its heightened emotion and Neo-Impressionist palette and brushwork, is a true star of the Andrew J. Sordoni Collection, 12 highlights of which are featured in this auction. The Sordoni Collection, one of the finest of Illustration Art, comes the Sordoni family and their beloved Wilkes University in Wilkes-Barre, Pennsylvania. Also from the Sordoni Collection is a second masterwork from Newell Convers Wyeth. "Mr. Cassidy ... Saw a Crimson Rider Sweep Down Upon Him ... Heralded by a Blazing .41," Bar-20 Range Yards, Part VII - Cassidy at Cactus, The Outing Magazine interior illustration, December 1906 (estimate: $700,000-1,000,000) harkens back to Wyeth’s roots painting cowboys and Western pioneers and is significant as one of the earliest illustrations of the story of Hopalong Cassidy, the fictional cowboy created in 1904 by author Clarence E. Mulford. Here, vigilante Slim Travennes, having been caught horse rustling, desperately wields his .41-caliber pistol and flees town on horseback as Cassidy and his Bar-20 gang pursue not far behind. A 20th-century cultural icon, Hopalong Cassidy is one of collector Andrew Sordoni’s favorite subjects, variously appearing in this auction in paintings by Maynard Dixon, Frank Schoonover, and George Gross. Norman Rockwell The Night Before Christmas (Santa Peering over Chair at Sleeping Child), Literary Digest magazine cover, December 22, 1923 (estimate $500,000-700,000) is one of 16 Rockwell works in the auction, 11 of which are from the Collection of Jack and Martha Campbell of Houston, Texas. Capturing in dramatic lighting a sleeping child and dog on Christmas Eve, with a jubilant Santa Claus peeping out from the shadows, this evocative and tender scene was featured on the cover of the Dec. 23, 1923 issue of Literary Digest and was Rockwell’s fifth and final cover illustration for the magazine. Executed between 1923 and 1968, the Rockwell works from the Campbell Collection represent a microcosm of the artist’s career and include important magazine covers, interior stories, book illustrations, and advertisements. Frederic Remington The Broncho Buster #73, March 25, 1908 (estimate: $250,000-350,000) is the artist’s first and most popular bronze sculpture, which evolved into a symbol of the spirit of the American West. Revered for his two-dimensional narrative scenes of cowboys on the Western plain, Remington here focuses on the vigorous, muscular movements of the rider and horse without any extraneous background setting. The Rough Riders (a nickname given to the 1st United States Volunteer Cavalry) gave one of the casts to Theodore Roosevelt in 1898; a different cast, presented to Jimmy Carter during his presidency, has remained in the White House ever since. Maxfield Parrish A Man of Letters [The Mudball], Life Magazine cover, January 5, 1921 (estimate: $200,000-300,000) from the Sordoni Collection, exemplifies the artist’s winning combination of precise draftsmanship, strong graphic design, and amusing characters, making him one of the most celebrated early 20th-century magazine illustrators. Spotlighting Parrish’s whimsical self-portrait character of the artist or “seer,” the illustration shows a sign painter sitting precariously on a board, meticulously rendering the title letters on the Life magazine cover as he is assaulted by a mudball wrecking his craftsmanship. Joseph Christian Leyendecker New Year's Baby 1919, The Saturday Evening Post cover, December 28, 1918 ($100,000-150,000) resonates exactly 100 years after it appeared on the cover of The Saturday Evening Post commemorating the Nov. 11, 1918 Armistice ending World War I. A twinkly-eyed, towheaded cherub, symbol of fresh beginnings, releases a dove of peace. This lot ranks among Leyendecker’s most famous Post covers, not merely by referencing a momentous historical event, but also by featuring his most iconic magazine character, the New Year’s baby. The Sordoni Collection comes from the family and Wilkes University, where generations of Sordonis have been involved with the university — the family donated a gallery to the university — and its art collection. This auction includes 12 lots from the Sordoni Collection.